I have not disappeared, except into the nether world of half-term. But I have managed three posts elsewhere, which have peculiar links between them - and they all have a similar theme: what chances do we have now to influence the economy, or any of the giant, sclerotic services which we pay so much money to. 1. Small scale #1. 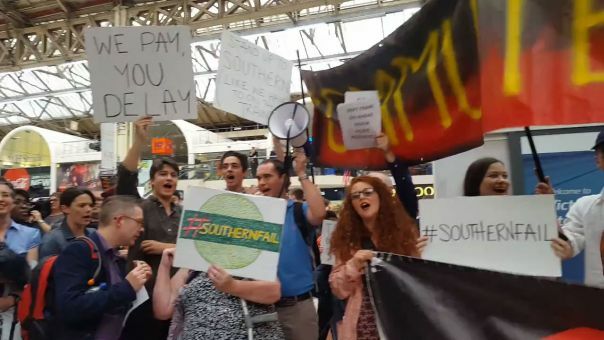 On The Real Press blog, I wrote about how we might bring any pressure to bear on the company behind Southern Rail to recruit and train more staff, so that they might run a service that is less insultingly unreliable (I speak as someone who tried to travel from Portsmouth to Shoreham on Saturday afternoon). In some ways, the RMT union has simply fallen into the trap set for them by the rail company, which now have a simple excuse to hand for their staggering in efficiency. So what do commuters do? What they have actually done is to employ a barrister to construct a legal case against the Department of Transport. 2. Small scale #2. Then there is the question of what kind of economy we can expect from Brexit, and whether it is a Southern Rail-style economy, dominated by condescending monopolies - or whether we can aspire to a genuinely entrepreneurial economy. Unfortunately for Whitehall, these two economies require diametrically opposed policies. See my post on the Radix blog for that one. 3. Small scale #3. Third was an uncompromising post I wrote on the blog of the RSA's Inclusive Growth Commission. It seems to me increasingly obvious how much, despite talk of a new, more 'inclusive' economy, the assumptions of Whitehall are still in thrall to discredited trickle-down economics. What can a small town do, for example, to promote small business - which is its very life - if its banks close? How can they support their local businesses? Yet that is happening all over the UK. All these dilemmas are not just real, they are also urgent. Brexit attracted the support of many people who instinctively grasp that small-scale is more efficient, more effective, more lucrative, more inclusive. Yet the institutions designed to support entrepreneurs is being allowed to wither. kley Point - for purely symbolic reasons, as a series of empty gestures to shore we are 'open for business'. Actually it is the exhausted economics of a generation ago, which threatens to treat everyone like Southern Rail treats its long-suffering commuters. 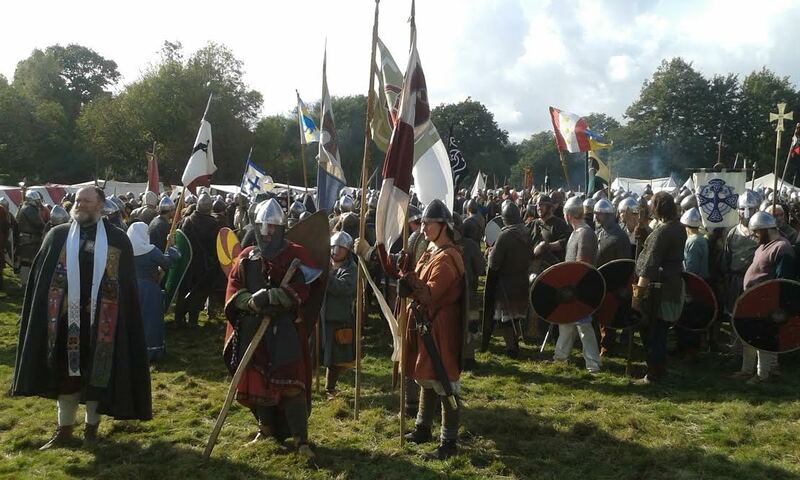 I spent yesterday watching the re-enactment of the Battle of Hastings, 48 hours beyond its 950th anniversary, in the grounds of Battle Abbey, and an extraordinary event it was. I was there partly to take my children and partly to sell my detective story based in 1119-20, Regicide: Peter Abelard and the Great Jewel. It was also a moving experience, and I've been trying to put my finger on exactly why. I believe it was because it was such a pan-European event. There was no doubt that the crowd was on Harold's side. But there was also a sense that this was what everyone said it was - the moment that England became part of Western Europe rather than Northern Europe. Although we might curse the destruction of the ancient liberties of King Alfred, and the Norman yoke (still with us), that is an inescapable fact of history. There was, in short, something of a paradox about the day. On the one hand, there was this sense of sturdy English resistance to continental rule - a kind of Leave version of history, but one I have some sympathy with (Margaret Thatcher kept Kipling's poem 'The Saxon is not like us Normans' in her handbag during negotiations about the British rebate). On the other hand, the amazing Saxon and Norman encampments, which had been braved by volunteers living an authentic medieval life for the weekend - despite torrential rain - was an inspiring example of continental co-operation. There were members of the English Viking Society, but large contingents dressed as Saxons also from France and Germany, Spain and Poland. What united them was a sense of, and expertise in, a shared European history. When Jean Monnet, the founder of what is now the European Union, said that - if he had the chance to relive his life - he would have based it on culture, not trade. Yesterday afternoon, on Senlac Hill, was enough to convince me that he was right. Somehow, the European obsession with managing trade has allowed it to garner some of the centralised pomposity that has served it so badly in recent years. And, yes, I'm aware of which nation that was responsible for putting the single market at the heart of the EU. Yes, good old perfidious Albion, that's who. But despite the great fog of Brexit, the recognition of a shared European history and culture was so much in evidence on the battlefield of Hastings yesterday, that it renewed my faith in a shared idea of Europe. And somehow, it doesn't matter how hard our Brexit is going to be - and I've come round to believing that only a hard Brexit can liberate us from the so-called Europe 'debate', so that English history, as part of European history, can continue - that sense of shared history will continue to unite us. It is also the spark on which we can rebuild a new European community when the EU has unravelled, and the contradictions and indignities of the euro - never mind Brexit - suggests to me that is the likely direction. This is the third and final part of my blog series about the development of green economics in the UK over the past decades, designed to mark the 30th anniversary of the New Economics Foundation and its relaunch this week. The New Economics Foundation was intended, not so much as a think-tank, but as a permanent secretariat for TOES (The Other Economic Summit), and regarded those counter-summits as the main purpose of its existence for the first few years. During those years, the first TOES speakers were beginning to find their way into the mainstream. 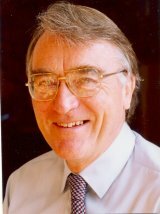 Professor David Pearce became advisor to Environment Secretary Chris Patten, Jose Lutzenberger became Brazilian environment minister, and a whole string of ideas shifted almost without anyone noticing into the mainstream as well – green taxation, ethical investment, alternative economic indicators, became almost conventional. Community banks sprouted all over the world, apart from the UK. The problem with a ‘new economics’ is that it was always hard to pin down, though nef’s first director Paul Ekins edited together the contributions to TOES as The Living Economy (1986). “I do not believe that such an economics yet exists,” said the Chilean radical economist Manfred Max-Neef at the original TOES conference in 1984. Part of the problem was that the old assumptions had power and money behind them. They still do. As the years went by, nef has had only five directors (Ekins, Hatfield, Mayo, Wallace and Stears), and the last three have covered the whole period from 1992 to 2016. But nef has also managed to lead the agenda on a range of issues at different times – even being voted Think Tank of the Year in 2002. Those issues include developing the concept of social auditing, including building a whole social audit department inside the Body Shop. They included developing alternative social indicators alongside KPMG. . They included various important interventions in the debate on better economic measures – including the UK version of Cobb and Daly’s Index of Sustainable Economic Welfare and the Happy Planet Index (downloaded over a million times around the world in 2006). They included the UK launch of the time banks movement and co-production and the launch of UK community development finance institutions. It included the development of a range of ideas around local economics including Local Alchemy, BizFizz and LM3. They included, more recently, a successful lobbying campaigns on Clone Town Britain and on the problem of fish depletion in European waters. It included a very great deal more besides. The counter-summits continued too. In Munich in 1992, all the TOES organisers were arrested on the eve of the conference. In Naples in 1994, they were given a guard of honour by the mayor. And finally, in 1998 in Birmingham, Blair and Clinton asked to see nef director Ed Mayo and Jubilee 2000 co-ordinator Ann Pettifor (now a nef fellow) at the height of the summit. Recent years have seen the emergence of the organisers network NEON and NEF Consulting. In fact, during those years, nef also became nearly the biggest think-tank in the UK (in terms of staff, though not in terms of income). The birth of the New Economics - what was it about 1984? 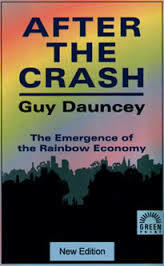 This is the second part of my series on the history of green economics in the UK, timed to coincide with the relaunch of the New Economics Foundation. This one looks at the launch of nef 30 years ago this year. Sally persuaded Jonathon Porritt, about to be appointed director of Friends of the Earth and then Ecology Party chair. Jonathon believed a counter-summit required a new organisation to manage it. He contacted James Robertson, whose influential book The Sane Alternative had recently been published. He and his wife Alison Pritchard, co-ordinator of the Turning Point network, hammered together a committee which met in Jonathon’s basement flat, around the corner from King’s Cross Station in London. Of course, TOES wasn’t the only challenge to the G7 leaders, over at Lancaster House – with TOES taking place around the corner at the RAC Club in Pall Mall. There were protest vigils outside by Quakers, protest drumming by Buddhists and a major CND rally in Trafalgar Square. The rest isn’t yet history, but it will be one day. Tomorrow: how the new foundation led the way into the 1990s. Four decades of green economics - what was it about 1973? At the same time, Alison was co-ordinating the Turning Point network - a range of thinkers and activists who were emerging with a bundle of ideas that looked remarkably coherent, and which were to emerge over the next generation as post-industrial alternatives including the new economics. “I don’t think I thought of myself as a new economist,” says James now. “I was influenced very much by Illich.”It was the post-industrial society, as much as the post-industrial economy, that James was working for. As such, he and his now wife Alison decided to set up home in the cradle of the original Industrial Revolution, in Ironbridge where they lived for five years before moving to their present home in Cholsey, Oxfordshire. Two different ways of holding our public services to account. One a do-or-die strike which stands in the great tradition of the Battle of the Somme, and other frontal assaults. The other an inovative, customer-led legal action. What is the way out of the appalling trains service we have been served by Southern Rail and its co-franchises, Thameslink and the Gatwick Express - all collectively managed by a finance operation called Govia Thameslink, which also happens to run a railway, and doesn't do it well? Today is Sledgehammer Day, thanks to the decision by GTR (Govia Thameslink Railway) to impose contracts on their guards so that, although they have promised to use them as customer service managers on trains where possible, they can if necessary run trains without them. That deadline is today and it promises even more chaos (though I notice that, during strikes, GTR does actually pull out the stops to get an effective service, which they don't most days). The successful crowdfunding of £25,000 to take the Department of Transport to court, which is something of a breakthrough for ordinary passengers. Barristers have already been appointed and they are currently battling to get the government to let the public see key documents - like the February remedial plan - which really ought to be in the public domain. The decision by the RMT union to hold 14 days of strikes before Christmas. This boneheaded decision - equally dismissive of ordinary passengers - risks handing the government and GTR the excuse they need to pretend that this is somehow the fault of the staff. This is what they have been struggling to achieve since the services unravelled back in April. I got involved in this crisis by having a strange conversation with member of platform staff back in June, blogging about it, and suddenly finding that the blogs had been read by over 100,000 people. Soon I was the centre of a storm - platform staff, drivers, guards, commuters and managers were sending me information from all over the region. I realised I would have to put it to use. That is why I wrote and published my conclusions, along with some history - and a look back at the old Southern Railways between the wars, which were a byword for efficiency (and smoked kippers). You can buy the kindle version of Cancelled! here, the paperback version here, and other e-versions here. What I have found so frustrating since then is that even the BBC persist in the canard that the appalling levels of service have been because of the dispute. This is what the government wants us to think - on the grounds of the mythical 'sicknote strike' in the summer - for which there was no evidence at all, except that sickness went up because of the huge strain that frontline staff were under in the chaos. But guess what. 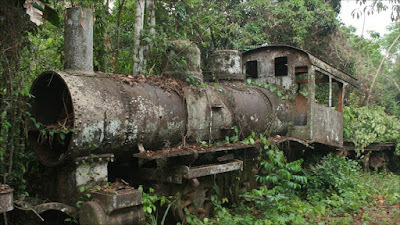 The sickness rates went back down again and the service stayed appalling, Night after night, passengers were forced to from motionless train to motionless train, in dangerously overcrowded conditions, ministered to by a heroic staff who were kept in the dark about what was actually happening. And to be fair, the managers were largely in the dark too. They didn't understand that their reforms, preventing depot managers from negotiating overtime locally, meant that the staff shortfall - which has remained a feature of GTR's finance-driven management - would not cover the missing shifts. GTR has kept staffing below minimum levels. Thee are not enough drivers. Platforms staff have been made redundant. Ticket collectors have been replaced by contract staff. I even applied to be a train driver myself, and have yet to get a reply. And all the time, they hoped to solve the problem by doing what their government contract insisted they should - impose driver-only operations on all their routes, and not just the urban commuters ones. In this sense, the collapse of services has indeed been about the dispute. There is an argument that driver-only operation is right for short services - and they have been for some time on Gatwick Express and Thameslink, which have had as a result the worst timekeeping record. But I've become convinced that safety demands two train crew to man long distance routes and to share responsibility for safety. The point about this dispute is not that GTR are planning to sack the guards. They have even tried negotiation, which GMT has barely done. They are not. They are retraining them as customer service managers minus a safety role, and without making them compulsory on services. This is GTR's get-out-of-jail free card. It means that, from today - assuming they get away with it - the principle will be in place that you don't need a guard in routes where you can't get hold of one. I've no doubt that this will eventually lead to the end of on-train staff. My attitude to the safety question is this for long-distance routes or long trains: would you do away with a co-pilot on flights, or redesignate them as customer service managers? Would that actually be 'modernising' the airways? Would that actually be welcomed by passengers? The real question is what we poor put-upon commuters can do about this situation, where otherwise intelligent people, caught in the web woven in Whitehall, find themselves believing two or three impossible and contradictory things before breakfast? Here are my suggestions. 1. Phone the BBC every time they suggest that the poor service this summer has been about the dispute. All the evidence suggests, and despite the best efforts of management and unions, that it was about serious under-staffing and poor management. 2. Get your MP to ask question in Parliament. Will the remedial plan be made public? Will they make the report by their new consultant Chris Gibb public? If not, why on earth not? Are we not affected by it? Is it not public money that is being used? 3. Demand a repayment for season ticketholders and other stakeholders. What do I want to happen? After Jeremy Corbyn's intervention, this is a good question. It seems to me that if a company messes up as much as GTR has done, then - for the sake of every other public service - the franchise must be reassigned. Especially if they have messed up for financial reasons. Who it is assigned to in the short term is less important than where we want to get to. The main problem with the GTR franchise has been the suffocating involvement of the Department of Transport. So it makes no sense to nationalise the franchise which can only make that situation even worse. No, long term, the objective must be to hand the franchise over to a new mutual entity which is owned by passengers and staff, That's the idea: mutualise, not nationalise. I wrote an article in the Guardian today defending Liberalism from the otherwise invariably correct Martin Kettle, and trying to distinguish it from neoliberalism. I made the mistake of reading about 200 comments below the line afterwards, which is always a depressing business, but could - in the midst of all the other rage - discern something of an argument emerging. There was a similar pattern going on in the Lib Dem Policy Debate Facebook page. The argument was about how much Milton Friedman was right that most monopoly was caused by governments - and whether, therefore, we are about to be stuffed, trussed and chopped up by the new private monopolies I mentioned. It is true that a number of the oligopolies that rule us, and most are the result of the wrong kind of regulation - the banks, the mega food corps, for example. Or is it that the government simply failed to regulate their market dominance, which would lead to a different conclusion? But do I really? I could go to huge lengths by refusing to sign Google's customer agreement or refusing to buy from Amazon when most of their high street rivals are closing their doors. I could theoretically avoid any company using Visa's payments system, but don't think I would achieve it. It is true that, as the situation stands now, the sins of those three are the same as the sins of Christopher Columbus (the monopolistic sins anyway) - that he wanted to take a share of every transaction involving the New World (the court case took two centuries and the Columbus family lost). They want to so insert themselves into the global economy that they can rake off a percentage of everything we buy. I don't believe that government regulation has caused that. Quite the reverse, it has failed to tackle it. I realise I make people extremely cross when I say - as Hilaire Belloc said before me in The Servile State - that we are on the verge of a whole new kind of slavery. 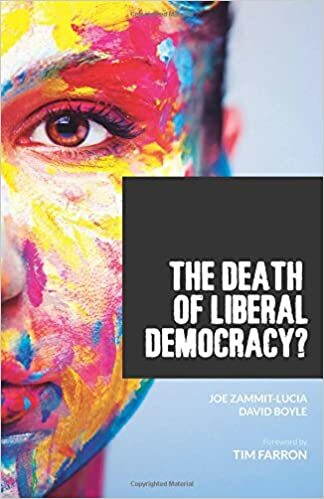 That is the message of my book (written with Joe Zammit-Lucia) The Death of Liberal Democracy? It is a slavery that will raise costs, lead to far worse customer service, but will have a far more dangerous effect over half a century. It is in fact a threat that will catapult us into chains. The European Union was blind to monopoly power - the impression I got from their competition regulators was that their main concern was building up European champions to take on the American behemoths. The Liberal parties of Europe, which should have been the main opponents of monopoly, have forgotten the issue. So who will defend us? I don't think the defence will come from Jeremy Corbyn, who it seems to me is equally blind to monopoly and giantism as the Labour Party has always been, and despite 'neoliberalism' having become the insult of choice for his supporters. I suppose I am hoping that we can, between us, build up a political head of steam behind the attack on monopolies, public and private - but without getting too over-excited about services which have to be delivered as such. Local councils and the NHS will have to be made responsive in other ways. And if we do that, then we will have brought a fiercer kind of Liberalism back to life.